We My friend3 and I have just come back from a week up in the Apennines4 where we have had some wonderful long walks visiting some old forgotten monestaries where there are only one or two monks left. In one splendid old building we found but one lonely monk. It is high on a mountain top and very few people ever take that terrific climb over a ruined mountain road. We found some wonderful latin manuscripts in his crumbling library. In another monestary, the famous Benedictine abbey of La Trinitá della Cava, we found the original code of the Lombard League. The place was founded by a Lombard king in 1030. It is a great rambling white building built against the side of a perpendicular cliff and below it is a dreadfully deep wooded ravine to which you can decend by a flights of steps cut in the cliff. Down there the angry little river Bornea[?] leaps along under its stone arches and turns the wheels of half-a-dozen little stone flower[?] flour-mills set here and there down the narrow, winding valley. I spent two long days in Pompeii5, which is so much more wonderful than anyone can ever imagine, and have returned here spend some time looking over the great Pompeiian collection in the Naples Museum. I love Naples and am living in a most delightful hotel situated right on the Bay of Naples6 which, I am convinced, is the most enchantingly beautiful body of water in the world. I have marked my balcony in the picture at the head of this note paper. I sit there every afternoon and watch Vesuvius change from violet to lilac and then to purple. I could almost throw a stone over to the tiny island of Megaris7 where Lucullus8 had his gardens and where Brutus9 met Cicero10 after the murder of Caesar11. The street singers sing all the old Neapolitan airs under my window every night, and every morning I go out and buy roses and camelias on the Spanish Stairs. The gardens in Naples are beautiful, and the Royal Museum is the richest I have in portrait sculpture I have ever seen—the Brittish Museum seems quite poor in comparison. The portrait sculpture of the Roman Emperors, particularly of the Antoinine house, leave nothing to be desired. The royal families were appear appear in youth and age, and I feel as if I had known every member personally. I have rubbed up my Latin enough to get through Tacitus12 and Suetonius13 quite carefully. This is the place to read those detailed historians, for details cannot mean much unless you are in the place where it has a physical and concrete reality. There was a photograph of the wonderful head of Caesar14 at the Naples museum in the copy of Allen & Greenough’s “Gallic War”15 which I read in Red Cloud16 under Mr. Goudy17. I always knew I should see the original some day, and I thought of Mr. Goudy when I came across that great head the other day in its lofty marble gallery. Of all the statues of Caesar I have seen it is the most wonderful. Such a head! 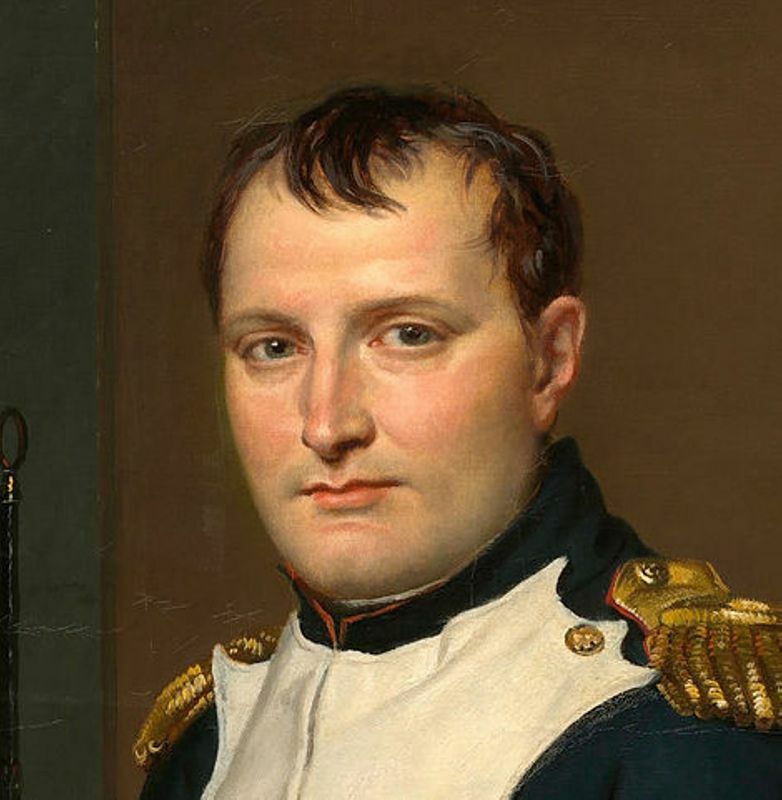 Napoleons18 is a wooden block compared to it. I go back and back to it and I doubt whether the world has produced another such head in all the centuries since. We spent a good deal of time in the vineyards and fields last week. The oranges and lemons are ripe in their orchards and the peach and cherry trees are in bloom. The vines are in little new leaf and the olive groves all along the Mediterranean19 are so soft and gray. All the country folk are in the fields [illegible] digging and planting the fall crop, and they do it just as Virgil20 describes in the Georgics21: the same heavy hoes, the same white saplings for the vines, the same old songs as the husbandmen toil along the furrows and work this old, old earth which has produced most of the beautiful things in the world. Next week we go to Rome22, but I shall leave Naples and the soft Companian country with tears, I am afraid. Such a ravishing world and such a short life to see it in! Document is one leaf, handwritten on recto and verso. 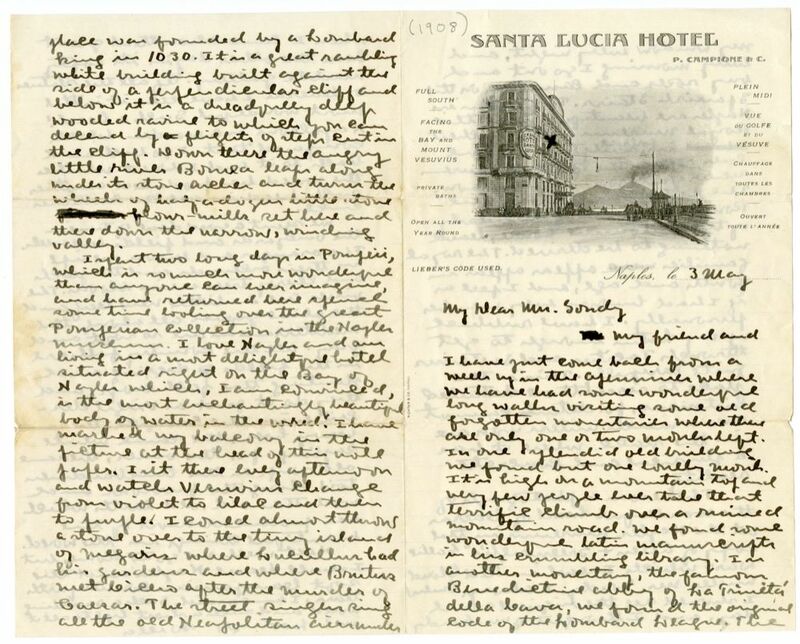 As Cather states in the letter, she puts an X over her balcony in the image of the Santa Lucia Hotel on the letterhead. More properly, Megaride, once an island and now a peninsula in the gulf of Naples. The image from the frontispiece of the 1886 edition of Caesar's Gallic War, Allen and Greenough's Latin Series, published by Ginn Company. Lucullus, Lucius Licinius (c. 110 BCE-56 BCE). Roman general. After an active military career in Asia, Lucullus was recalled to Rome in 66 BCE and replaced by Pompey. During his remaining years he kept out of state affairs and spent lavishly on public shows and improvements to his estates, including his Castellum Lucullanum on the Island of Megaride in the Gulf of Naples. Cicero, Marcus Tullius (106 BCE-43 BCE). Roman orator, politician, and philosopher. Cicero did not take part in the assassination of Julius Caesar but approved of it. 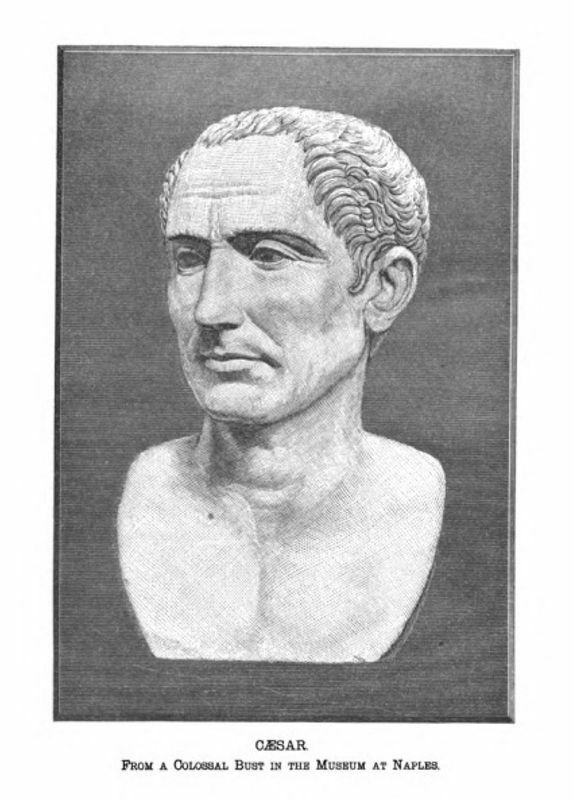 Julius Caesar (c. 102 BCE-44 BCE). Roman statesman and general. In the 58-49 Gallic Wars (58 BCE-49 BCE) Caesar brought all of Gaul under Roman control, establishing his reputation as a military leader. At the time of his assassination by C. Cassius Longinus and Marcus Junius Brutus, he was dictator for life of Rome. 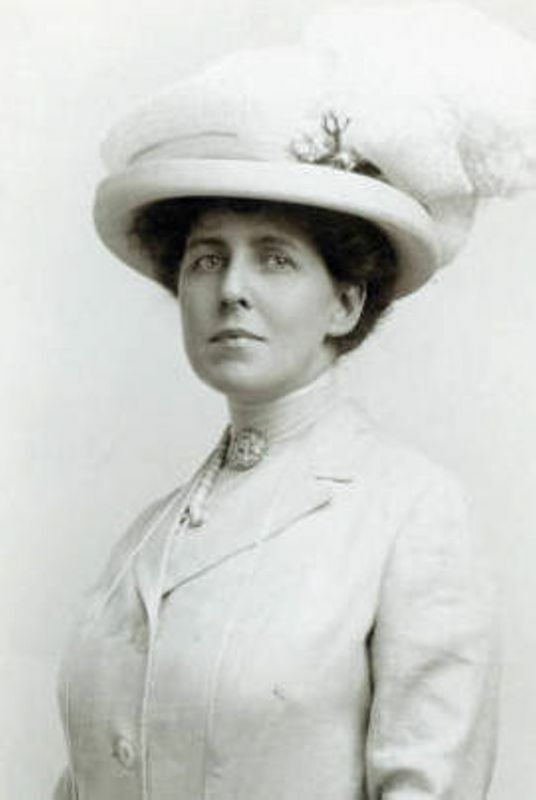 In a number of Willa Cather’s works, most notably The Song of the Lark (1915) and The Professor’s House (1925), characters read Caesar’s Commentaries on the Gallic War. Tacitus, Cornelius (55-117). Senator and historian of the Roman Empire. Tacitus’s major works of history, the Annals and the Histories, survive in incomplete form and treat the reigns of the Roman emperors in the first century A.D.
Tranquillus, Caius Suetonious (c. 59-c. 140) (“Suetonious”). Roman biographer. Suetonious’s De Vitae Caesurum, a collection of biographies of the twelve Caesars (emperors of Rome), beginning with Julius Caesar and ending with Domitian, survived in a nearly complete form. 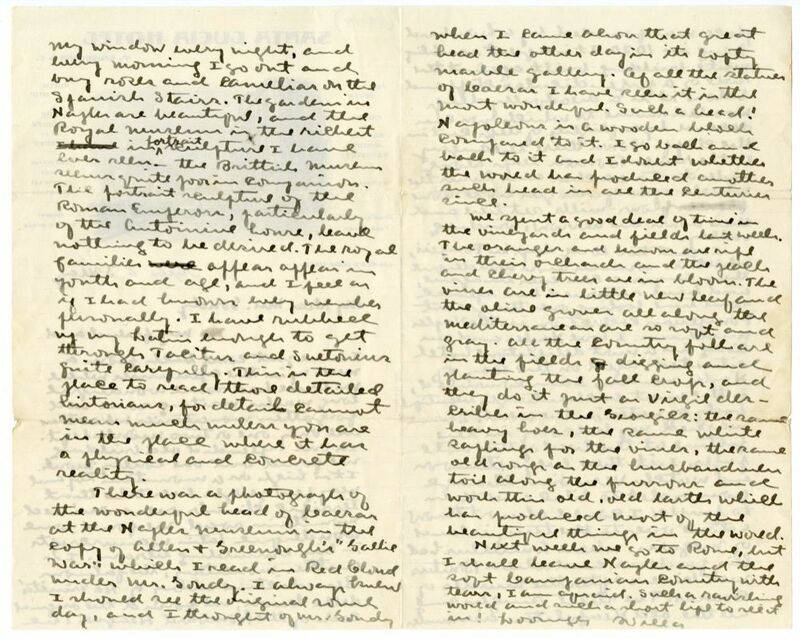 Before visiting Rome in 1908, Willa Cather read Suetonious in Latin. Goudy, Alexander K. (1847-1906). Cather’s high school teacher. Alexander Goudy was born in Ohio and educated in Illinois. He came to Pawnee City, NE, as principal of the high school in 1874. 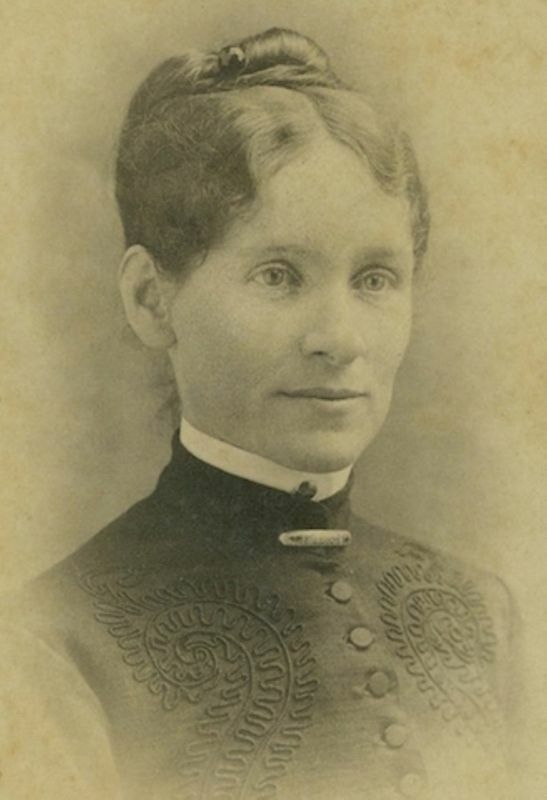 He married Alice Dailey in 1882 and they both taught at the Nebraska State Normal School in Peru, NE; he served as Nemaha County superintendent of schools before going to Red Cloud, NE, in 1888. In 1890 he was elected Nebraska state superintendent of schools, and in that capacity enacted the state’s free textbook law. Alice Dailey Goudy, his wife, worked with him as a high school principal in Red Cloud and as assistant state superintendent. After Goudy’s second term ended in 1894, he taught school in Lincoln until suffering a stroke about 1900 and retiring to Nemaha County.